With the semester almost ending, I’m glad that my second DRSS-Tesla Coil is finally done! 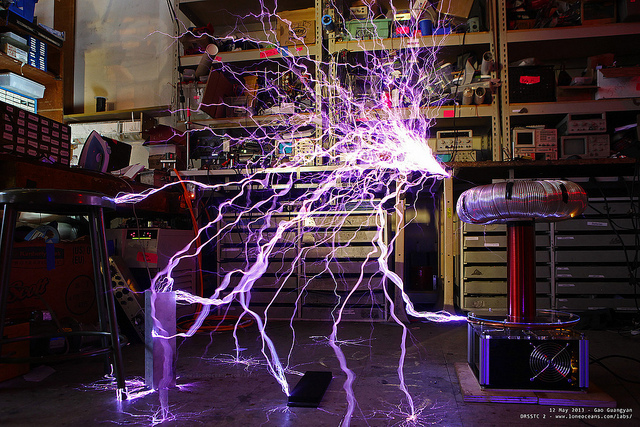 DRSSTC 2 began almost a year ago with the goal of making my first tesla coil using brick-style IGBTs. The project began when I bought two Toshiba IGBT half-bridge modules on ebay, good for 150A 600V. The original plan was to build a compact and powerful DRSSTC running this full bridge, with about a foot long secondary. The coil also uses a revised version of Steve Ward’s UD2 as the driver. After many months of work, I finally got everything put together. Unfortunately, initial tests were worrying, and I soon found out that one of my IGBTs was half-dead. With the lack of time and money, I wasn’t able to continue with these bricks. I managed to get hold of a CM200DU-24F 200A 1200V IGBT and decided to make a half-bridge coil instead. The CM200 bricks are larger, so I wasn’t able to fit a fullbridge inside the box I had already made. Finally, this worked perfectly and everything came together. Video of the coil in action! For more information, please visit www.loneoceans.com/labs/ – writeup with full details in progress!